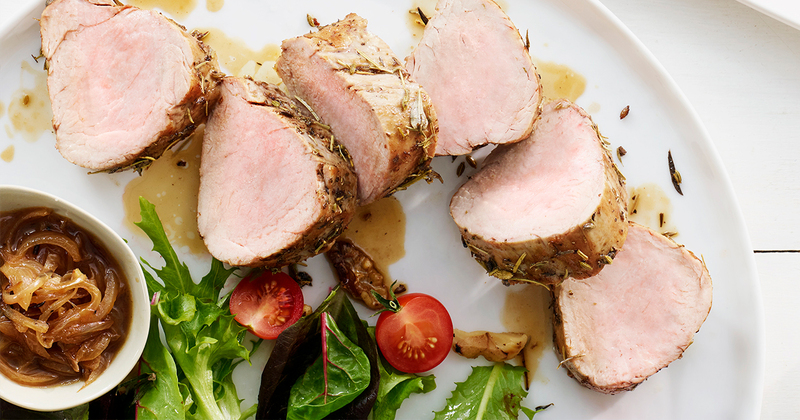 Brush oil over Open Prairie® Natural Pork Tenderloin. Season with the herbes de Provence, and salt, if desired. Heat large nonstick ovenproof skillet over medium-high heat. Add pork and cook, turning occasionally, until browned, 3 to 5 minutes. Place skillet with pork in oven and cook until meat is barely pink when cut into with a small sharp knife, 12 to 15 minutes. Remove from oven. Transfer pork to chopping board. Let stand for 3 to 5 minutes. Add shallot and butter to skillet and stir over low heat until shallot softens, about 2 minutes. (Skillet will be hot so stirring will keep the shallot and butter from burning.) Add wine and increase heat to high. Bring to boil, scraping up browned bits in skillet with wooden spoon, and cook to reduce liquid by half, about 2 minutes. Remove from heat. Cut pork crosswise into ½-inch slices and transfer to plates or a platter. Drizzle pan juices over pork and serve. Tips: Substitute ½ teaspoon dried basil and ½ teaspoon dried thyme for the herbes de Provence, if desired. Serving Suggestion: Serve as part of a main course salad of mixed baby greens, cherry tomatoes, roasted beets and toasted walnuts, along with your favorite vinaigrette. Beverage: Serve a light French red, such as Beaujolais, with this dish.